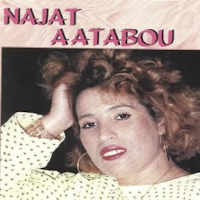 Here's another Najat Aâtabou album that I don't see anywhere else online. It's from 2001, the followup to "Attention A Monsieur", which I posted a few months back. It has a mainstream-chaâbi feel similar to that album, except that the viola and oud (?) 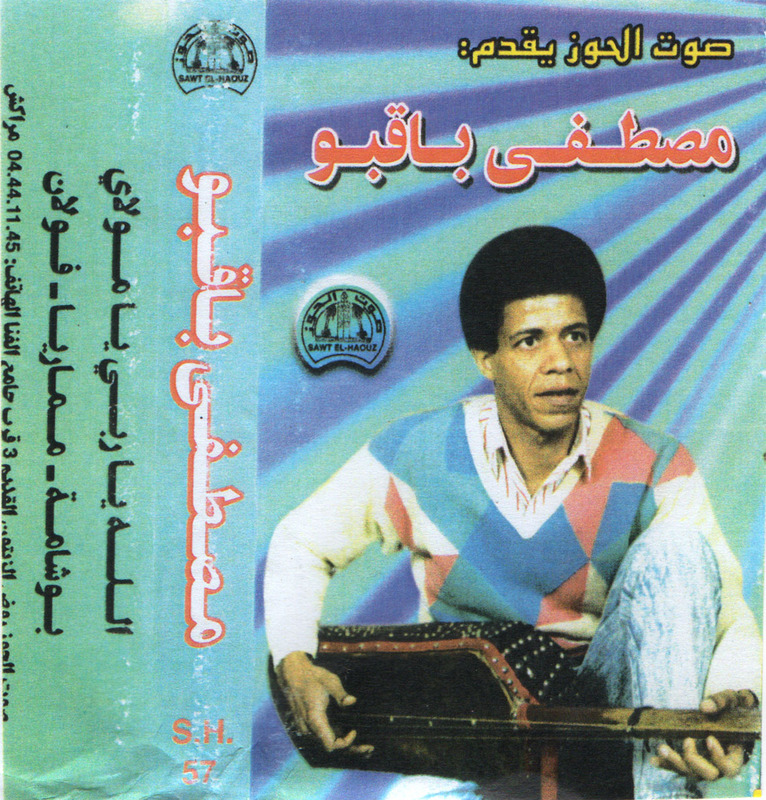 are replaced by what sounds like a steel-stringed plucked instrument - can't tell if it's a bouzouk or possibly a guitar. At any rate, as with the previous album, the keyboard bass gives the album an overall "programmed" sound. The percussion is prominent in the mix, and the textures vary nicely from song to song and verse to verse. As is typical for much 21st century Moroccan chaâbi, the production is a little too perfect for my ear. Still, Najat's singing is as powerful as ever, and it's hard to argue with the kicking, 13 minute medley that closes the album. Apologies to those to whom I owe an email, shout out, or other overdue salaam! Wishing everyone a good and groovy New Year! US voters elected over 100 women to Congress in this week's midterm election. May they be as fierce as these awesome âouiniyat ladies out of Marrakech! Salaams, good people! Sorry for the long dry spell. All's fine here at Moroccan Tape Stash, despite the generally befuddling times. 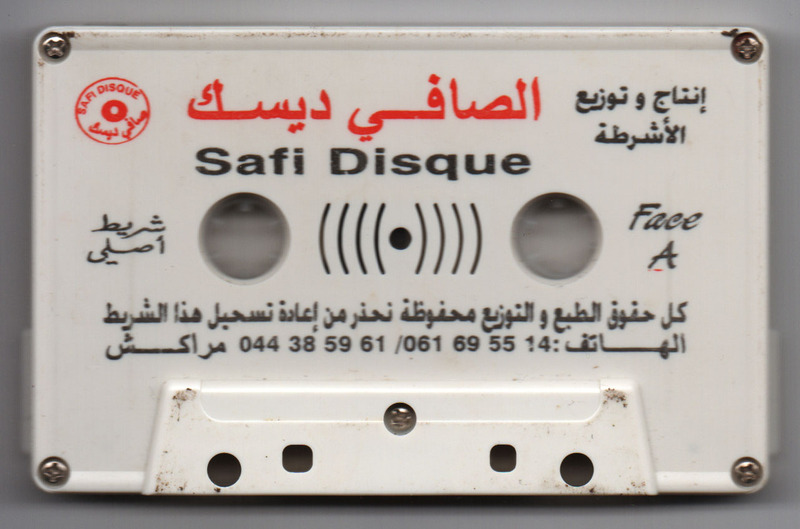 If you’ve visited Moroccan Tape Stash before, you know that your humble curator loves chaâbi tapes from the days of drum kits and electric guitars. How about we add some saxophone to that mix! Here’s a vintage gem from the stash - an early tape by Khalid Bennani, picked up on my first trip to Morocco in 1992. According to his biography at Ournia, Bennani performs primarily for “private parties such as weddings and engagement ceremonies”. I have the greatest respect for a good wedding band - being able to satisfy folks old and young, from near and far, is not always easy. And if we’re talking about Moroccan weddings, that means having a fresh, diverse, and extensive repertoire that will give rhythm to a party for hours, often deep, deep into the night. Bennani is based in Casablanca but is a native of Taza (between Fes and Oujda) and plays a Fessi repertoire, including melodies reminiscent of the Arab Andalusian and melhun repertoire, devotional strains from the Aïssaoua brotherhood, and tunes evoking the Jbala region of northwestern Morocco. Fessi chaâbi is usually too smooth for my tastes. I prefer things more raucous, à la Casablanca or Marrakech style. This album, though, manages to achieve a texture that is somehow both smooth and raucous! Maybe it's those snare drum punctuations from the drum set along with the syncopated electric rhythm guitar, a darbuka prominent in the mix. Here's an upgrade of my all-time favorite Gnawa tape! 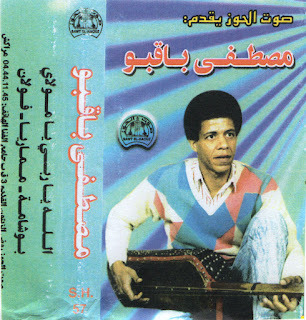 This is a great recording of Marrakech's Mustapha Baqbou, solo with a guinbi, singing and masterfully strumming a few songs, mainly from the Black repertoire (the Ouled al-Ghaba). Without qarqaba-s and choral responses, this is an intimate session where the guinbri is on display. And nobody rivals the virtuosic touch and subtlety that Mâalem Baqbou brings to the instrument. I estimate a late 80s or early 90s date to the recording. Double big thanks to Mr. Tear: first for the original upload at the Snap, Crackle & Pop blog, and then for finding another copy of it and sending it to me! The sound is a little better on this copy than on his. However, it's about 8 minutes shorter - so I digitized this one and patched the remaining minutes from the other copy. I think it's an upgrade to the earlier upload, though that one is still available here if you want it. Disco-Graphic notes: I used to have a copy of this years ago - the photo of Mâalem Baqbou was the same, but the background was different. I think my copy was on the widely-distributed Fassiphone label (out of Fez), as was Mr. Tear's copy. 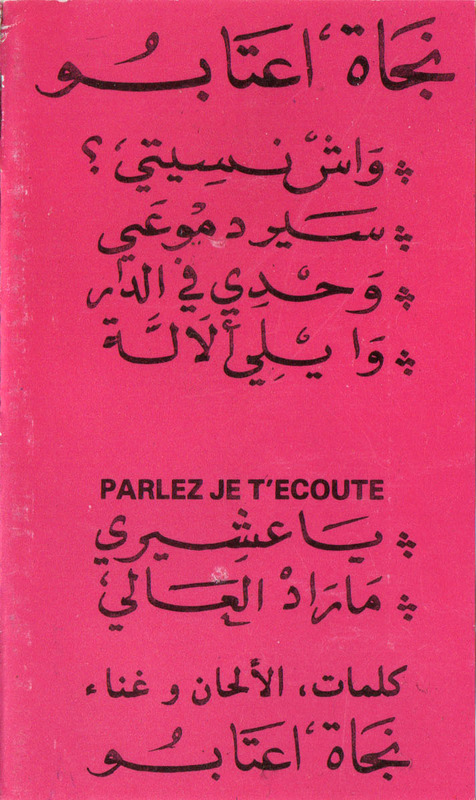 The j-card of this one, however, indicates that it was issued by the Marrakech label Sawt el-Haouz. My guess would be that it was originally recorded for the Marrakech label, then licensed to Fassiphone. But I could be wrong. 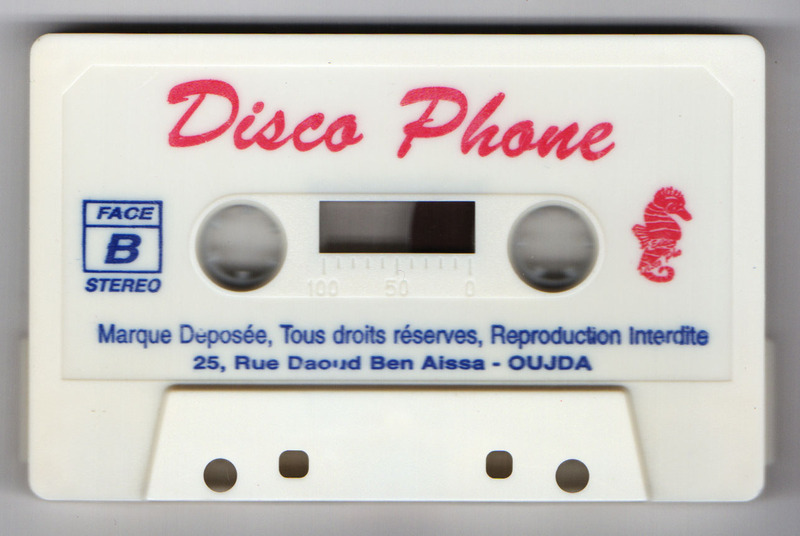 Also, the cassette shell for this copy gives yet another production house: Disco Phone, way over in Oujda. 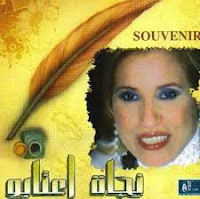 After the success of Nouveau 92, Najat Aâtabou did not return to the oud and bendir format of her earlier hits. Rather, she adopted various other instrumental combinations, moving eventually toward a more mainstream chaâbi sound. I own copies of some of these cassettes (without j-cards), and have lost a few along the way. Also, some of these are available to stream or purchase online. So I'll mainly post here links to existing web resources and try to piece together her discography between Nouveau 92 and Attention Monsieur (2000). And Najat's singing is spectacular. Those folks over at Edition Hassania really knew how to record her - whether accompanied by a simple oud-and-bendir ensemble or a full orchestra, her voice remains powerful and startling. 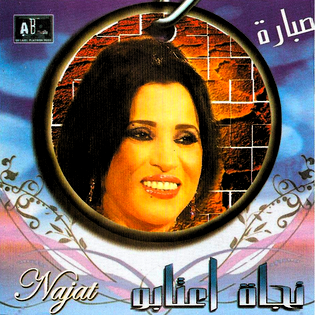 This is, I believe, the last album that Najat released on Edition Hassania. I used to have a copy of the cassette. Like the previous albums, this one is also driven by the viola. But the style is different here. Rather than a chanson moderne style of viola playing, hearkening to the smooth sounds of the modern Arab orchestra, here we have a straight-up dance-inducing chaâbi fiddle! The overall ensemble is more simple - bendirs, some oud and melodic keyboard here and there, and what sounds like a drum machine (hi-hat and some fills). Though a return to oud and bendir-s is nice, the chaâbi viola really dominates the mix and doesn't quite work for me. That being said, the tune "Baadou Lhih" is awesome and became part of her live repertoire. I had a dub of this album, and I remember it being on label called something like "Safa Disque". (It wasn't the well-established Sonia Disque, with whom she would later record.) The leadoff track "Aatani Bedhar", also known as "Mali Ana Ma 3andi Zhar" was a smash hit - smooth chaâbi groups were covering it, and with its singalong chorus of "Wa-a-a-a-ayli", it was an instant classic, and one of Najat's biggest ever hits. I love it! It was around this time that studio-produced chaabi in Morocco started to sound a bit too perfect and precise for my ears. Though rhythms were still driving and percussive, drum sets had given way to drum machines and programming, which could feel mechanical. Electric guitars for rhyhmic and chordal accompaniment were rarely found anymore, replaced by more versatile synthesizers, which could also add a variety of melodic textures. Even oud-s and violas began to sound more processed and perfect. I tend to like my chaâbi (and most music) a little on the sloppy side - I appreciate being able to hear the human interactions and imperfections. That said, when all the elements come together in a studio production, it can be great, and that's the case throughout this album. The oud remains prominent in the mix, the real or synth strings (I can't always tell which) support without being overbearing, the rhythm section pops and crackles, the synth bass keeps things funky and in the pocket, and Najat and the backup choir sound great! 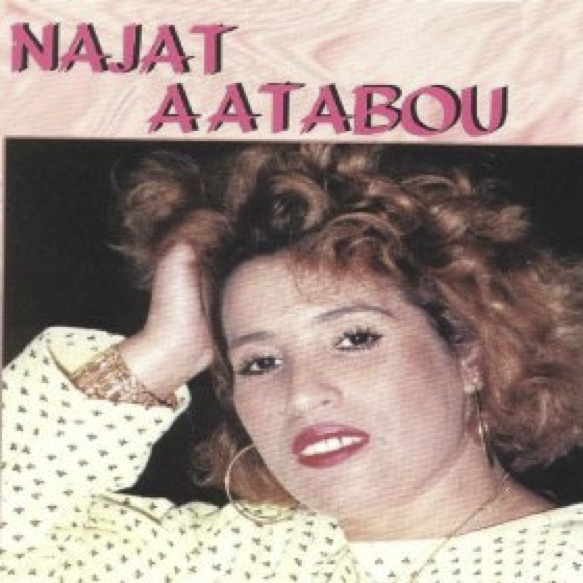 A mega-post on the ARAB TUNES blog has this album, and many others by Najat! According to this interview, Souvenir, like its predecessor Sabara, was produced by Najat's former husband Hassan Dikouk. It has a similar overall sound to Sabara, and Najat seems to have comfortably settled into a mainstream chaâbi setting. To my ears the sound is a little less punchy - a bit more emphasis on the viola and less on the oud, and the vocals seem more subdued. But when it works, like in "El Aati Houwa Allah" and "Daba Ytem El Nachat", it still kicks. 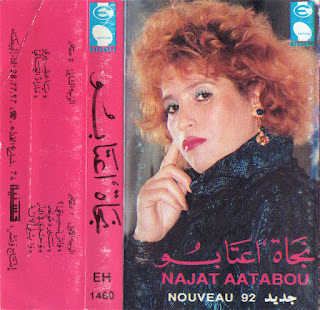 My cassette copy of this (get it HERE) contains a track not available on streaming platforms - a spoken message from Najat to her public, presenting her new cassette, on which, she says, she has tried as always to move chaabi song forward, and that the most important measure of its success is "your entertainment, clapping, and pleasure". I don't know what prompted the inclusion of this rather apologetic message. Perhaps her moves into mainstream chaabi were criticized by some sectors of the public. Or perhaps she was nervous about the leadoff track, which has a distinct Latin feel and a light programmed percussion track, straying further away from her roots than usual. (This was the era of Amr Diab's smash Egyptian hit "Habibi ya Nour el Ain". Unlike that track, though, Najat's does not include the soon-to-be-ubiquitous-in-Arabic-pop flamenco guitar.) On streaming versions of the album (like the YouTube playlist embedded below, or Amazon's version), there is a bonus track - a chill lounge remix of the title song, with light funk electric guitar and Middle Eastern strings replacing the punchy synth horns of the original. Outside of the title track (which was not a big hit), the rest of the album features a pretty standard chaâbi texture, though a bit more sparse than the previous two albums. I couldn't quite put my ear on what was different at first. I heard a viola and a synth banjo, some restrained programmed rhythm with a live darbuka. There is a funky synth bass again, though it's very low in the mix as compared to the previous albums. The really key difference here, though is that there is NO BENDIR! Throughout all of her albums, whether based around the oud, the viola, or a full orchestra, the one constant is the presence of the buzzy bendir! On this one, though, the only buzzy timbre you can hear is the occasional taarija. The low percussive tones, are not buzzy booms, but clean synth bass drums. Which is a weird idea, but it sort of works for me. The viola-centered sound of this album hearkens to 1995's Taqi Fia Allah, but with punchier rhythm and overall sound. Again, the chaabi viola isn't my favorite instrument to hear with Najat Aâtabou's voice, but this ain't bad. 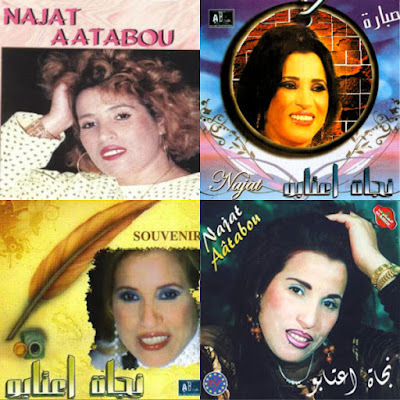 I saw Najat Aâtabou do a concert in Casablanca in 1999, and the only songs she did from any of these 5 albums were "Mali Ana Ma 3andi Zhar", from Sabara and "Baadou Lhih" from Taqi Fia Allah. But although these albums may not be packed with hits, there's worthwhile material on all of them. My ear for Moroccan lyrics isn't developed enough to critically assess Najat's 1990s songs in comparison to the earlier hits that brought her to fame. A lot of the same themes seem to pop up - complaints about romantic relationships, trying to keep things cool with mom, patience, acceptance, and calling out hypocrites. Her turn toward a mainstream chaâbi sound strikes me as a way for her songs of support and solidarity to resonate with a broader community of Moroccan sisters. At any rate that's my interpretation for now. Am happy to hear other opinions. Glad y'all enjoyed the last Najat Aâtabou post. I'm working on new post about her recordings from the 1990s - keep an eye out for that soon. Najat Aâtabou - Nouveau 92 جديد - A Whole New Bag - Hai Hai Hai! Nouveau 92! A new sound and a new look for Najat Aâtabou. 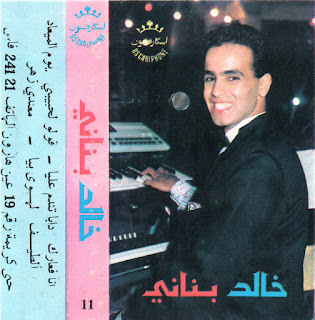 And a huge hit with "Wahdi Feddar" ("Alone at Home"), a.k.a. "Goul El Hak El Mout Kaina" ("Tell the Truth... Death is Real"), "Hadi Kedba Bayna" ("This is an Obvious Lie"), "Kedba Bayna, or "Hai Hai Hai". New sound: We've shared several of Najat Aâtabou's early, oud- and bendir-driven albums here at Moroccan Tape Stash. (See here.) 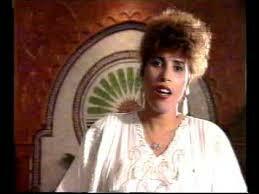 That stripped-down sound launched her to stardom in Morocco in the 1980's. (The one exception to this formula, in her early years, was a fascinating orchestral album in the chanson moderne style.) With "Nouveau 92", Najat went in a different sonic direction: the viola leads the melodic accompaniment and a funky synthesizer bass underpins a synth string section, while the rhythm section is driven by a darbuka and what sounds like a hi-hat. (If a full drum set is present, it's being played very lightly.) It's an unusual sound - not your typical viola-driven chaâbi texture. Top it off with Najat's fierce vocals, and you have something nouveau! Huge hit: "Hadi Kedba Bayna" was an instant classic! The refrain features the repeated line "Hai Hai Hai", which is both a great singalong and an interjection expressing disbelief or annoyance, something like "whoa" or "oi" in English. And the verses were basically rhyming couplets, calling out her man for cheating on her and then lying about it. It's the type of song that can easily be incorporated into any group's repertoire and to which other singers can add new, amusing, and thematically appropriate lyrics. 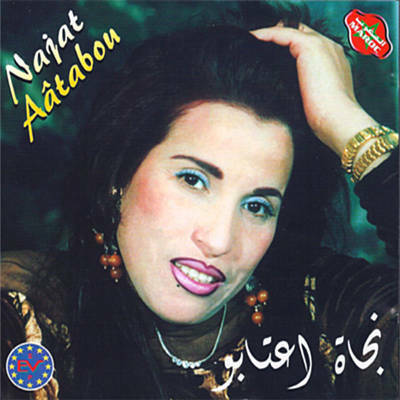 "Nouveau 92" was the first Najat Aâtabou album I ever heard. When I first visited Morocco in 1992, the album was huge, especially "Kedba Bayna". The album was at one point published on CD in France (now out of print). "Kedba Bayna" was included (as "Just Tell Me The Truth") on the 1995 US compilation Morocco: Crossroads of Time (also now out of print). Reissue notes, for the discographically inclined: Here at Moroccan Tape Stash, I usually give you the running order of tracks exactly as they appear on the tapes. Sometimes this running order differs from what is printed on the j-card. 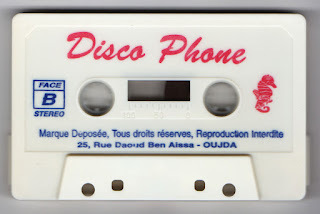 I usually prefer to be faithful to the way the tapes were heard in thousands of Moroccan cassette players rather than the way one person transcribed the song titles when the j-card was going to print. For this album, though, I am going to go with the j-card running order. The copy I'm sharing here is not my original 1992 copy of the cassette - that one is long gone - but rather one I obtained several years later (probably in the late 1990s). I have a strong memory of this album beginning with "Wash Nsiti? ", and of "Wahdi Feddar (Kedba Bayna)" being buried somewhere in the middle of the side, as is listed on the j-card. 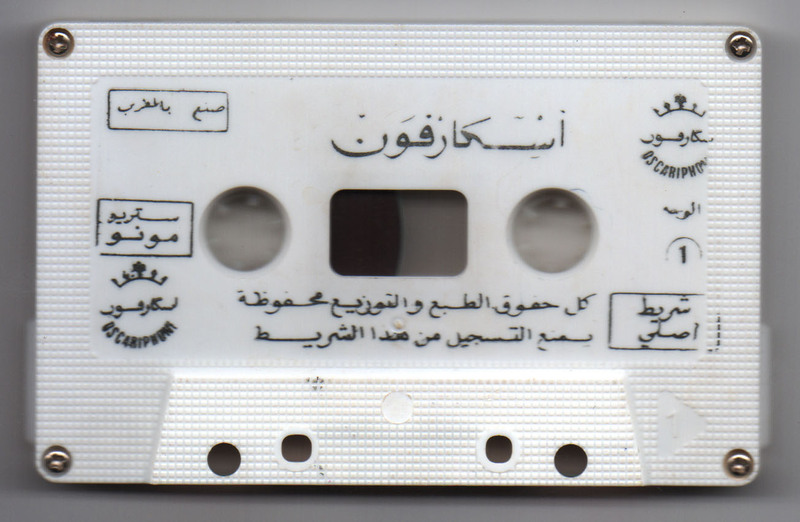 On this cassette, however, "Kedba Bayna" leads off side A.
I'm guessing that once "Kedba Bayna" became a big hit, the song order was switched so that it would appear at the beginning of the cassette, where it could be more easily found. In those days, if you went shopping for cassettes and wanted a particular song, the tape seller would pop the cassette into a deck and play it, so you knew you were getting the correct tape. That's much easier to do when the song isn't somewhere in the middle of the tape. So... I've resequenced the running order to match what is on the j-card, because that is closer to my memory of my original 1992 copy than running order of the copy I digitized here. (And also I like it better.) 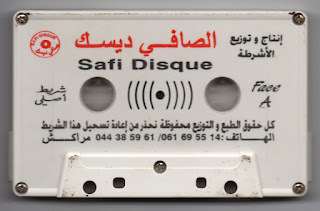 For the record, the running order on this late 90's copy is: A1-Wahdi Feddar, A2 Sir Dmou3i, A3 Wayli A Lalla, A4 Ya 3achiri, B1-Wach Nsiti?, B2-Parle je t'ecoute, B3-Marad al 3ali. Watch out, Mister! Najat Aâtabou sez: jealousy and suspicion will give you high blood pressure! This album dates from 2000. It wasn't a huge success, but I enjoyed it at the time, especially the title track. In those days, Najat Aatabou was married to musician/producer Hassan Dikouk, who produced some of her hits of the 90s including the great 1996 smash Mali Ana Ma ândi Zhar. I believe the relationship had its ups and downs before they eventually divorced. (According to this 2016 interview with Dikouk, they split in 2002. However, they were still performing together as late as this clip from New Year's 2004-5.) This album apparently comes from one of the down times - she actually calls out Hassan by name at the end of verse one, substituting "A Hassan" for the anonymous "A Monsieur" (2:14).